Anna Lou Blackburn, age 78 of Prestonsburg, Kentucky, passed away on Monday, January 28, 2019 at Highlands Regional Medical Center, Prestonsburg, Kentucky. She was born September 20, 1940 in Floyd County, Kentucky to the late William & Margie Collins Maynard. 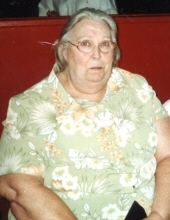 She was the wife of the late Earl Dean Blackburn. She is survived by her Son: Randall Dean Blackburn of Prestonsburg, Kentucky; Daughters: Ruby Ann (Kevin) Tackett of Harold, Kentucky, Velinda Gaye Goble of Prestonsburg, Kentucky & Anita Renee Blackburn Crider of Prestonsburg, Kentucky; Sisters: Estillene Maynard of Prestonsburg, Kentucky, Polly Stevens of Pierceton, Indiana, Emma Lee Hunt of Prestonsburg, Kentucky, Della Faye Hackworth of Prestonsburg, Kentucky & Virginia Jervis of Prestonsburg, Kentucky; 10 Grandchildren & 10 Great Grandchildren; A Host of Nieces, Nephews, Family & Friends. Along with her parents and husband she was preceded in death by her Son: Earl Thomas Blackburn; Brothers: William Benjamin Jr., David Maynard & Gerald Ray Maynard. She will be missed by all that knew and loved her. "Email Address" would like to share the life celebration of Anna Lou Blackburn. Click on the "link" to go to share a favorite memory or leave a condolence message for the family.